To Blink on the "Ships starting with B" page. This painting was received from, and is owned by, Arne Wiborg, who says it's 50 x 75 cm. 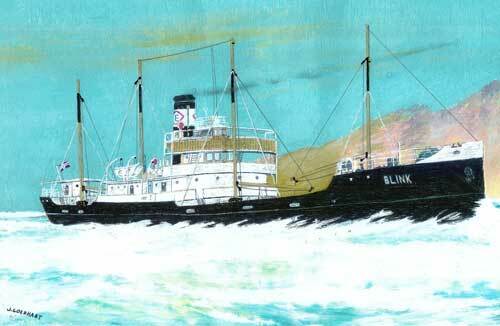 Blink, pre war - received from (and painted by) Jan Goedhart, Holland. Tonnage: 2701 gt, ca. 4000 tdwt. Built by C. Hill & Sons, Bristol in 1920. Previous name: Arlette until 1933. According to the external page that I've linked to above, she was delivered as Arlette in June-1920 to Cie. Auxiliaire de Navigation, Nantes. From 1924, Cie. Auxiliaire de Navigation, Rouen, no name change. Renamed Blink for Skibs A/S Manitowoc (K. Th. Einersen), Oslo in 1933. Message in my Guestbook - A wonderful tribute to Birger Lunde from a neighbour. Message from granddaughter - and right underneath it there's a Guestbook message from a relative of Gunner William Lewis (here's another one from the same person). Message from sister of casualty - Robert Siteman (one of the 5 killed while still onboard Blink). Message from relatives of John Donace - another casualty. Another Guestbook message - From the grandson of one of the survivors, George Johnston. If anyone would like to contact him, I'd be glad to pass on an address - my contact address has been provided at the bottom of this page. Here's another message from George himself (Apr.-2009). A more recent message - From the niece of John Donace. Warsailor Stories - A letter from Birger Lunde to BBC; an account of his wartime experiences on misc. Norwegian ships (named further down on this page). Previously traded E. coast Canada/U.S.A. As will be seen when going to Page 1 of the archive documents, Blink was on her way from Savannah to Antilla when war broke out in Norway on Apr. 9-1940. He says she was in New York in the summer of 1940, loading general cargo for Havana, Cuba. After 3 days in Havana she proceeded to a port on the east coast of Cuba (possibly Caibarien? See archive document) to take on board a cargo of sugar for New York, and later headed back to Cuba (Antilla?) to load another sugar cargo for New York. After having unloaded this cargo in New York, they heard they were going to New Jersey to pick up ammunition for the U.K., and as a result of this several crew members left, and she was unable to proceed due to the lack of crew; only 14 out of 30 remained. (As can be seen, Page 1 shows a long stay in New York in the fall of 1940). After having been laid up at Bayonne for a couple of weeks the captain had managed to get together a full crew, partly from the training ship Danmark, which was laid up in Jacksonville, Fl., partly from New York and Boston. After New Jersey, Blink went to Botwood N.F. for a cargo of pyrites. She left for New Orleans around Nov. 1, stopping en route at Newport News for coal bunkers. The captain's wife came on board there, having escaped from Norway to Sweden, from there to Russia, then by way of the Trans-Siberian railway to Vladivostok, across the Pacific on a ship, and finally across the American continent by rail to Newport News. (Blink was on charter to the Philadelphia company Simpson, Spencer & Young; the Simpson in this name being the Simpson whose well known Wallis was the reason for the English King's abdication). Again, compare the details in these 2 paragraphs with the info found on Page 1. Her 1941 voyages also start on this document, showing another long stay in New York that spring and it also looks like she remained in Halifax for quite a long time that summer, having arrived there from Quebec - she proceeded to Sydney, C.B. on Aut. 18. Together with Akabahra, Astra, Audun (from Iceland), Balduin, Carrier (returned), Einvik (sunk, follow link for details), Evviva, Fagersten, Fanefjeld, Grado, Gudrun, Heien, Hestmanden, Hildur I (the last 3 joined from Iceland), Ledaal, Leka, Lom (from Iceland), Marga, Nesttun (from Iceland), Orania (returned), Reiaas (from Iceland), Siak and Spes, A. Hague has now included her in Convoy SC 41, which departed Sydney, C.B. on Aug. 24-1941 and arrived Liverpool Sept. 11; Blink, cargo of pulpwood (station 55), stopped at Loch Ewe that day. Her voyages in this period are shown on Page 2. It looks like her final destination was Rochester, where she arrived on Sept. 17 and again had a long stay in port. SC 41 will be added to an individual page in my Convoys section, but for now, see ships in all SC convoys. The following month she's listed, along with Erica, Hildur I, Lago and Lisbeth, in the U.K.-Gibraltar Convoy OG 76, which originated in Milford Haven on Oct. 26, but Blink (which had sailed from Oban on Oct. 29) returned to port following a collision with the British Empire Pelican (also in OG 76), and arrived Ardrossan Nov. 1. She left Ardrossan again for Clyde on Nov. 8, later joining Convoy OG 77 from there, but again returned (convoy originated in Milford Haven on Nov. 24, Blink had sailed from Clyde Nov. 26). According to Page 2, she had been bound for Huelva. Other Norwegian ships in Convoy OG 77 were Hellen, Selbo and Sirehei (the latter also returned). These 2 OG convoys will also be added to individual pages in my Convoys section; in the meantime, see the page naming the ships in all OG convoys. At the end of that year, we find her in the westbound North Atlantic Convoy ON 49, which originated in Liverpool on Dec. 21-1941 and dispersed on Jan. 5-1942, Blink arriving Tampa independently on the 18th (she had joined from Clyde) - see the section naming ships in all ON convoys. The Norwegian Bur, Ravnefjell, Titanian and Veni are also included in this convoy. From Tampa, she proceeded to Charleston, S.C. on Febr. 4, then embarked on her last voyage. Blink left Charleston again on February 9-1942 (see Page 2). She had a cargo of 3600 tons of phosphates for Ipswich and was bound for Halifax in order to join Convoy SC 70 back to the U.K., but didn't make it to Halifax. On Febr. 11 she was hit by 3 torpedoes from U-108 (Scholtz), position 35 00N 72 27W, about 160 miles east of Cape Hatteras. The first one hit on the port side and went straight through the ship (hold No. 2) without detonating. The next two, about 1 min. later, hit amidships in the engine room, also from the port side, destroying the port lifeboat. The radio station was destroyed, so no SOS was sent out. She was armed with a 3" gun but this was not used as the U-boat was not seen. Uboat.net (external link) gives the date as Febr. 12, attacked at 02:40, German time, sank at 03:34 - "Nortraships flåte" gives time as 20:45 on Febr. 11 for the initial attack, sank at 21:10. Uboat.net adds that she had been "sighted at 14.49 hours the day before and was attacked the first time at 16.11 hours, but the G7e stern torpedo was a dud and a second G7e missed. The U-boat then had difficulties to overtake Blink again due to heavy seas and four hours later almost collided with her during a second attack attempt, avoiding by diving underneath the ship when only 50 metres from her". 5 men were assumed killed, namely 1st Engineer H. Dahlman, Donkeyman K. Johansen, the Dutch Stoker Pieter Roos, Canadian Messboy Robert Siteman, and the British Gunner William Lewis. See my links to the Commonwealth War Graves Comm. website further down on this page. 23 got in the starboard lifeboat, while the South African Stoker H. Gillik and the British Galleyboy A. Pappacena were seen heading for a raft, never to be seen again, though some weak lights were later observed behind Blink, which lead the others to believe that the raft had been launched. The survivors set sail, heading for land. The next morning the lifeboat turned over and Able Seaman R. Graves drowned, the 3d mate having tried in vain to save him. When the boat capsized they lost all their bread and water. They managed to straighten the boat, then swam around while 2 men attempted to get the water out of it, but this proved impossible due to the heavy seas that kept washing over it, so they all swam back and reboarded. The boat capsized several times, and by Febr. 13, 11 men remained, sitting in the boat with cold water up to their chests; one by one the others had died, including the captain. On the 14th only 6 were left, but that afternoon they were spotted by the lookout on the American D/S Monroe (W. W. Glendaniels) in position 33 34N 71 41W and rescued. All of them were hospitalized in Baltimore. At 1700 Stoker K. Larsen lost his mind and died. At 1830 Ordinary Seaman P. Winther lost his mind and died. At 1900 passed by a ship about 800 meters away. Signals were made, but the ship continued on its way without having seen us. Half an hour later we passed another ship, this time a little closer. The same signals were given, but in vain. At about 1900 the 3rd Mate K. Johansen lost his mind and died. At about 2100 Cook Eriksen lost his mind and died. At about 2200 Ordinary Seaman F. George lost his mind and died. At about 2230 Ordinary Seaman O. Sahlin lost his mind and died. Wind northerly, force 6, sea northerly, force 4. Drifting with wind and current. The sea continuously washed over us. The lifeboat is still about half a foot under water. At about 0100 Trimmer J. Donace lost his mind and died. At about 0300 Captain S. Ulvestad lost his mind and died. At about 0430 3rd Engineer Sørensen lost his mind and died. At about 0500 2nd Engineer K. Johansen lost his mind and died. At about 0700 Gunner J. White lost his mind and died. At about 0430 Stoker Kvia lost his mind and died. At about 0700 Able Seaman E. Plume lost his mind and died. At about 0900 Able Seaman A. Hennum lost his mind and died. At about 1100 Stoker M. Larsen lost his mind and died. At about 1200 2nd Mate F. Feydt lost his mind and died. At 1530 a ship was spotted. Our signals were seen and 20 minutes later we were taken on board S/S Monroe, Captain W. W. Clendaniels. Aboard S/S Monroe we received good care. 1st Mate B. Lunde (see further info below), Steward Harry Friis (later settled in Seattle, died in 1997), Ordinary Seaman O. Numme, Ordinary Seaman A. Thorbjørnsen, Stoker G. Gulliksen and Ordinary Seaman G. Johnston. At 1200 arrived Baltimore on S/S Monroe. Ordinary Seaman G. Johnston was taken to a hospital immediately. The rest of us were taken to the Coast Guard Station where we were questioned. Afterwards we were taken to a hospital". Signed O. Numme, G. Gulliksen and B. Lunde. All of them had hallucinations while in the lifeboat. Gulliksen was fished out of the sea twice, once after having "gone to bed" in a "real" bed he had seen in the water, with white, clean sheets, another time after he had attempted to walk up to a hotel he had seen "further up the street". 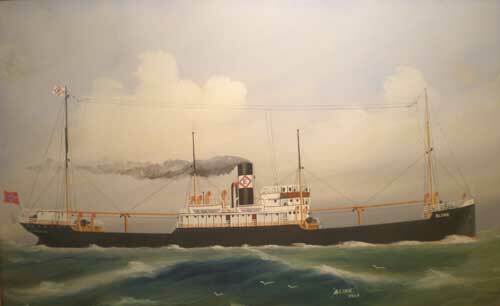 As Chief Mate on the S/S Blink I found myself during the winter of February 1942 off Cape Hatteras in a bad storm. Things got worse and in the middle of the night the ship was torpedoed. We were able to launch one life boat and spent the remainder of the night hove to. In the morning, we searched for some of the crew who had been seen during the night on a life raft. We never found them again. While trying to make sail in the bad weather we were unable to handle the boat and it turned over on us. We lost all our provisions. For the next 3 days we struggled to keep the boat upright. It turned over three times and each time we were able to swim around it and set it right. Under the conditions this was an incredible accomplishment and really is a tribute to the skills of men I sailed with. In the end we decided to leave the boat flooded and sat in the cold and windy water. A very cold and strong northwind kept the boat almost constantly awash. Despite our best efforts to help one another, slowly one by one the men lost hope and died. Heavy seas ran almost constantly through the flooded lifeboat. Each wave seemed to take away more of our strength. At one point on the second day a man died every hour. All of us had trouble focusing our minds and we all experienced periods of black out and total despair. It was so sad to see them go, one by one. Something I was never able to get over or put behind me. All my life they would follow me especially when I slept. Our Captain spoke at length to me of his family just before he died. When he died, I became the last officer and the remaining men turned to me. Such feelings are difficult to describe and will always be with me. When they died we did what we could and then cast them into the sea. At some point in our ordeal the sharks discovered us. They followed the bodies and now hungry for more began to try to pull us out of the flooded lifeboat. Tired and beyond exhaustion we now found ourselves hitting at the sharks with our last boat hook. Yelling, screaming through swollen lips and tongues and pounding at the sides of the lifeboat, doing anything to make them go away. In an ordeal like this, hope is the great life force and when a man lost it he quickly perished. Hope was the only thing that sustained any of us and only someone who comes through an ordeal like this knows its real value. At some point I realized this and knew I must focus my mind on surviving or be lost. Late on the end of the third day the SS Monroe spotted myself and one other crewman waving. The lookout reported to his captain that "I see two man standing in the water, waving". There were five British Seamen in the lifeboat, four perished during our ordeal. Of the 23 sailors that got into the lifeboat only six in total survived the punishment. I was the only officer to survive and my report to the U.S. Navy was later included in the book Track of the Gray Wolf. I have enclosed a copy of 2 pages out of that book. Because of the hopelessness and hardship the Blink sinking became known as one of Norway's worst wartime disasters. At first the Norwegian press in America wrote articles wondering what we had done wrong. Later I would meet some of the journalists and when they found out the true story they did their best to tell of our suffering. The maritime hearings were held in New York on March 12-1942, with B. Lunde (in his cabin at the time of the attack), Able Seaman Numme (on lookout duty on the bridge), and Steward Friis (in the saloon) appearing. Birger Lunde had previously served on Brimanger and Hosanger, and had been on board M/S Taranger when she was sunk in May-1941 (follow the link for more info), then joined Lysaker IV. After the loss of Blink, he signed on Oregon Express and was injured when she was sunk in Sept.-1943 (again, follow the link for details - see also his letter). He also briefly served on Polarland. During the war he was awarded the St. Olav Medal with oak leaves by King Haakon VII. He later served on American ships, Korean War, settled in the U.S., died in 1996. I have been in touch with his son who has told me that he made a point of visiting all the families of each of Blink's casualties after her loss. Most Norwegian seamen would have known him, as he devoted his life to helping them get their war pensions, working tirelessly to beat the bureaucracy. After his death, a magnificent memorial in the form of a painting depicting his life was hung in the church in his home town of Fana, Norway. For info, U-108 was also responsible for the attacks on Christian Krohg, Tolosa (the latter just a couple of days before Blink was sunk), Norland and Breñas - follow the links for details. *Stoker Gulliksen had been on board since Dec.-1941. He had previously served on Primo, Brand and Aust (according to this external page). After the loss of Blink, he joined Tropic Star, Thorshammer and Biscaya. * Billy McGee, England has told me that F. George, mentioned in B. Lunde's diary under Febr. 12, is commemorated at Tower Hill, Panel 17. He was from Enfield, Middlesex, 17 years old. Further details on him can be found on this page at the The Commonwealth War Graves Comm. website (date is given as Febr. 11). I also found the 20 year old Canadian Robert Siteman; he's commemorated on Panel 22 at the Halifax Memorial (he can also be found by entering the name of ship in the relevant search field of the Candian Merchant Navy War Dead database). Additionally, Blink's Gunner William Lloyd Lewis is listed on this page, commemorated on Panel 71, Column 3 at the Portsmouth Naval Memorial. There's also a Gunner John White listed on this page, commemorated at the same place, Panel 72 - probably Blink's gunner(?). All these links are external. Also, please see these messages from relatives of some of the casualties. There's also a message from George Johnston, who survived the ordeal. Stavern Memorial commemorations - Norwegians only are commemorated at this memorial in Stavern, Norway. Back to Blink on the "Ships starting with B" page. Other ships by this name: This company later had another ship by the name Blink from 1947. See Post War info for Inger Lise. Also, Norway earlier had a whale catcher named Blink, built 1911, 128 gt, sold to Chr. Salvesen & Co., Leith in 1913, then to Durban in 1926. D/S A/S Bestum, Oslo owned a ship by this name in 1932, originally built as War Cross in 1917, renamed Ars for owners in France 1919, Cap d'Ailly 1927, then Blink in 1932. Renamed Hsin Ping in 1933 (Shanghai), lost off Hong Kong in 1937. Additionally, a Blink of 907 gt was delivered in Jan.-1957 for the management of Bøhme & Ursin-Smith, Oslo. Sold to Stavanger in 1969 and renamed Sirabuen, then Normannvik the following year for owners in Oslo. Sailed as Arne Vik from 1973 (Stavanger owners), Panamanian Tropic Venture 1974, Indonesian Batik 1975, broken up 1984. The text on this page was compiled with the help of: "Nortraships flåte", J. R. Hegland and misc. The details on her early voyages was found in an article in "Krigsseileren" No.1/1979, written by someone who was on board at the time. The casualty list was found in B. Lunde's report and was compared to the list in "Sjøforklaringer fra 2. verdenskrig", Volume I (Norwegian Maritime Museum), then adjusted accordingly. The moving account of the days spent in the lifeboat (by Birger Lunde) is from the book "Tusen norske ship" by Lise Lindbæk. The book was translated to English under the title "Norway's New Saga of the Sea" - see My sources for tips on how to find a copy. It's mainly based on Lise Lindbæk's interviews with seamen during the war, and was first published (in Norwgeian) in New York in Nov.-1943 (my page Rudzin's Diary has another example of what can be found in it).